2050 is not as far away as you think. Decisions we make today will affect how well our children are able to cope with the impacts of climate change a few decades from now. Unless our priorities shift toward reducing emissions of heat-trapping gases and preparing for climate change, these impacts are projected to continue to worsen for our children and their children after the year 2050. Imagine a future where our children and grandchildren are able to enjoy pure air and clean water, the regional economy is vibrant and everyone can enjoy the beautiful outdoors. Without local leadership and collaboration to prepare for the impacts of climate change, this future may not be a reality. We can all agree that now is the time to work together to protect our children’s and grandchildren’s quality of life in the San Diego region. This report is part of an effort by Climate Education Partners (CEP) to engage local expert scientists, educators and a wide range of community leaders. Together, we are helping San Diegans learn more about, prepare for and respond to the impacts of a changing climate. Bringing to life the energy and commitment of the 2050 Report, this video connects San Diego’s community of leaders and scientists and highlights the actions people are taking. It’s designed to help others understand how our region is working together to sustain our quality of life. In 2016, Climate Education Partners released new findings that identify and address the impacts of a changing climate on business and economic growth in the San Diego region, with a focus on health. Click here to read the brief. In 2016, Climate Education Partners released new findings that identify and address the impacts of a changing climate on business and economic growth in the San Diego region, with a focus on water. Click here to read the brief. 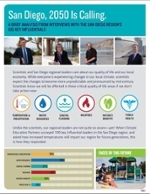 Scientists and San Diego regional leaders care about our quality of life and our local economy. While everyone is experiencing changes in our local climate, scientists expect the changes to become more unpredictable and pronounced by mid-century. Scientists know we will be affected in these critical quality of life areas if we don’t take action now. Unlike the scientists, our regional leaders are not quite so aware—yet! 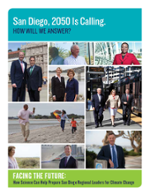 When Climate Education Partners surveyed 100 key influential leaders in the San Diego region, and asked how increased temperatures will impact our region for future generations, this is how they responded. Read our report here.